I love anything with apples, they usually have such a lovely natural sweetness…this looks yummy, I may well try my first infusion with apples! Good starting point! If you like citrus a great mix is 6 granny smith with four key limes. Do you have to keep this in the fridge? What about the vodka after? How do you keep it? Hi Donna, thanks for the comment! If you follow this recipe directly, you will not need to refrigerate either during the infusing time or after you have strained the liquid. The alcohol content is high enough that it is not required. I simply keep it in a bottle in a dark closet or cupboard along with the rest of my liquor. I think I’m going to have to infuse something with apple now! You may like the apple pie bourbon. And I agree, it is apple infusing season! 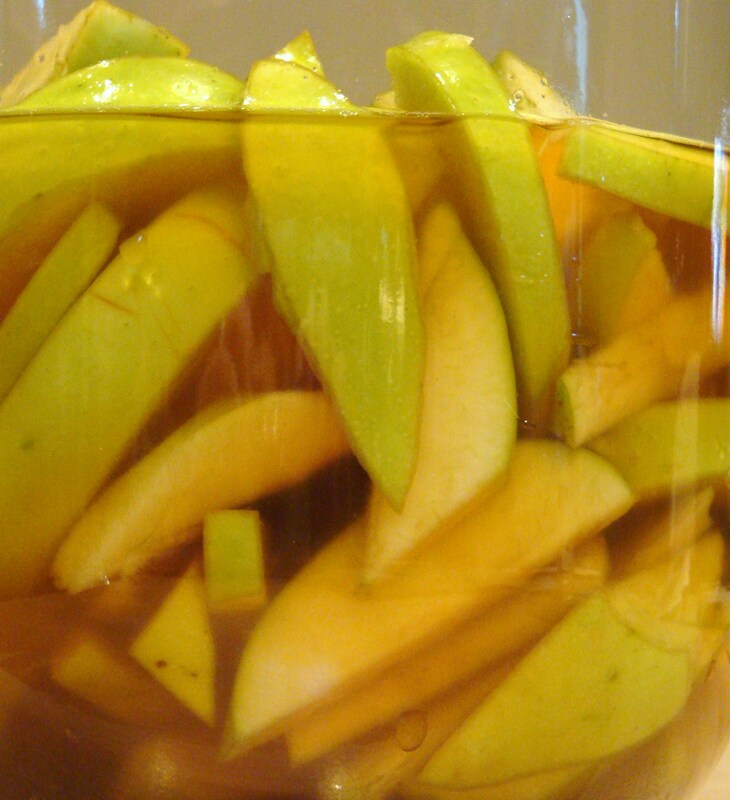 I’ve got an apple cocktail (rum), and am going to up the apple flavor even more by infusing that rum. But I think I’m going to do it side by side with a bourbon for a Christmas gift, which should be nice and smooth by then. You’ve done so many dynamite recipes. I get a kick reading from your site. Enjoy. Thanks for the compliment! I think you will like the apple infusions. 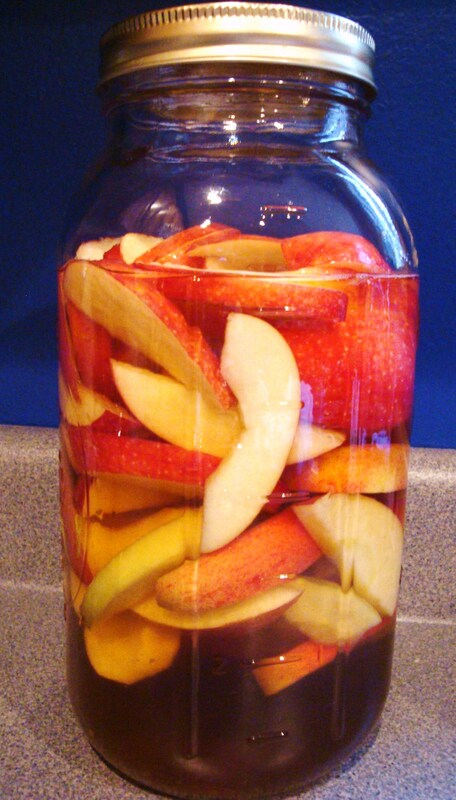 I have done 4 varieties of apple infusions by now, and they always turn out great. I think doing the bourbon v. rum is good too because you can decide how to use each one. I think they would both be good in toddies this winter! Hi, thanks for your comment. You will want to keep the jar indoors, out of direct sunlight. There is no need to refrigerate. Good luck! how long can you keep this apple liqueur want to try this. Question: all your recipes seem to be “jar-sized” – do these scale well? We are just getting into this infusion stuff, but have a LOT of apples…was thinking about using food-grade 5 gallon bucket or two. Do you know if this will present additional flavour challenges? Hi there! I’m a little late to be party, but I’m taking a stab at my first alcohol infusion to give as Christmas gifts. Is it okay that the apples sort of stick out above the alcohol since they float? It looks like that’s what’s happening in your photos too, but I want to make sure that they won’t rot since they aren’t under the alcohol line. Thanks! Yes, as long as you have ensured that enough alcohol has infused into the fruit. It’s ok if some of it floats up. Eventually they will sink once the alcohol takes over. The fruit will end up looking pretty unappealing.